← Examples of Snare Drum Notation, Part 1: 1589-1797. The name Edgar Allan Poe was popularized most recently by the movies of Roger Corman (b.1926) starring Vincent Price (1911-93): The Fall of the House of Usher (1960), The PIt and the Pendulum (1961), The Premature Burial (1962),4 The Raven (1963), Masque of the Red Death (1964) and The Tomb of Ligeia (1965). I went to see these movies because, as a young boy, I had read the tales upon which they were based and the sound of Poe’s words had captivated me; he was reported as having a vocabulary of over 150,000 words, and he spoke several languages. Poe was born in Boston, Massachusetts in 1809 and died in Baltimore, Maryland in 1849.5 His criticisms, essays, grotesque tales and sensual, mellifluous poetry influenced an entire generation of French Symbolists and Impressionists.6 He is credited with inventing the Detective Story genre which later inspired Sir Arthur Conan Doyle (1859-1930). Poe’s tale The Gold Bug (1843), began a fad for cryptology in the United States 7 and inspired William Friedman (1891-1969), to devote himself to deciphering codes which eventually resulted in his breaking the “Purple Code” of the Japanese prior to the outbreak of World War II. But today Poe seems to have dropped beyond the general public’s literary horizon. I wonder if his tales and poetry are being taught or even recommended to students in public schools and I wonder too if his tales of the macabre, so lacking in physical violence and concerned more as they are with individual psychic struggle, would fare well in today’s entertainment market. Yet Edgar Allan Poe had a great impact on Western literature, primarily with European writers, and for a brief time achieved fame in his native United States, as an author, critic and lecturer particularly after the publication of his poem The Raven (1845). My interest in composing electronic music began when I decided to take an electronic music course under the tutelage of Gustav Ciamaga (1930-2011) at the Royal Conservatory of music in Toronto. My first and, as it turned out, last composition in that genre was ULALUME an Electro-Acoustic ballad for magnetic tape and Japanese Buddhist temple bowls inspired by Poe’s poem of the same name. 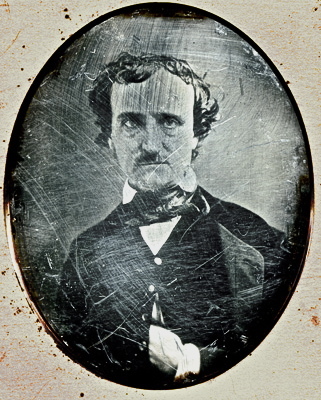 Ulalume, the first verse of which appears above under the photograph of Poe, was written in 1847 at the request of a Rev. Cotesworth Bronson. Rev. Bronson was to give a lecture on public speaking and wanted a work that demonstrated vocal variations in expression. Ulalume Was written during Poe’s last creative period. In my mind the mood of Ulalume is closely aligned with German romanticism as expressed in the paintings of Caspar David Friedrich (177401840) whose dark, mysterious paintings of forests with subordinate human figures express the feelings of Poe’s work. And I also hear the Adagio, Scene in the Country, of Hector Berlioz (1803-69) Symphonie fantastique (1830) with the the English horn’s plaintiff call. Berlioz and Poe maintain that melancholy was the source of their creations. The first performance of “my” Ulalume was scheduled for Expo 70 in Osaka, Japan but disruptions in travel delayed my arrival and the opportunity went begging. The work was never played and I have no idea what became of the tape, but its simplicity remains in my mind and when I read Ulalume now, I can hear the sounds. 1. sere – dry; arid : a harsh life on the sere granite ledges of those remote offshore islands- dry (esp. of plants) withered. 5. Poe’s alleged addiction to drugs has been rejected by modern scholars, but he is known to have been a user of alcohol and contemporary reports show that he was often drunk. Joseph W. Walker found Poe, lying delirious in a street outside Ryan’s Tavern in Baltimore. He was taken to a hospital and died four days later at five o’clock in the morning of October 7. 1849. He was dressed in clothes that were not his. 6. Stéphane Mallarmé (1842-96), Paul Verlaine (1844-96), Arthur Rimbaud (1854-91), Charles Baudelaire(1821-67). Édouard Manet (1832-83), illustrated the Stéphane Mallarmé translation of Edgar Allan Poe’s The Raven, 1875. 8. As quoted by Laurence Meynell in his Introduction to Tales, Poems, Essays, Edgar Allan Poe, (p 15), Collins, London and Glasgow, 1966. E. A. Poe grave, Baltimore, MD.